This event takes place, right after the recent event, involving Bawon Sanmdi and the discovery of ancient ruins of Black Crag Keep. “In this dry and dust country, the dark man was watching his trunk for some hours. Silently. All these candies he had PAINFULLY harvested were all his. He will be well off for the next year, the duration the portal would take to open again. However something was bothering him. And suddenly, he understood - his beloved masks. - Grmpph grmphhh. Grumphh grumph grumph! -Reinforce the defenses and confine fights in a limited perimeter, purge areas, kill innocent if needed. We can't take any risk. Redeploy availables troops in the CIty! Wait! You say these masks give the ability to reach any destination? -I didn’t say anything my Lord! But the Supreme Patriarch and his council seems to think this is the case. -Interesting. You enlighten my day officer! Try to collect those mask… they could be useful… and let's turn them against our enemies. “My Lord. It appears a great Orc Warlord lays dead on the floor! - My Lord! The Inevitable City is under attack! Some strange creatures are appearing from nowhere and are attacking population! The city guard are reporting they are all using very strange masks. The magi of the Lyceum are letting you know, they have detected a very powerful, dark magic emanating from these masks. They think they give its owner the power to walk through dimension! It seems that our enemies have infiltrated the city using them! But with all these masks, we don't know who is an infiltrator and who is not..
-I didn’t say anything my Lord! But the magi are convinced that's the case. Masks-Vendetta-Propaganda also called Most Valuable Players is a multiple purpose event. Some monsters have stolen Bawon’s masks to enter your city. Fight them and collect the masks to prepare your little vendetta. Some suspicious persons introduced Bawon masks in the city, spreading rumors against your faction, corrupting inhabitants and making them mad. Stop them all before they put fire to your city. Bawon’s mask gives you the possibility to hurt your enemies in the heart. Equiping a mask gives you the ability to tag for city scenarios. Mark your enemies, kill them and collect rewards. 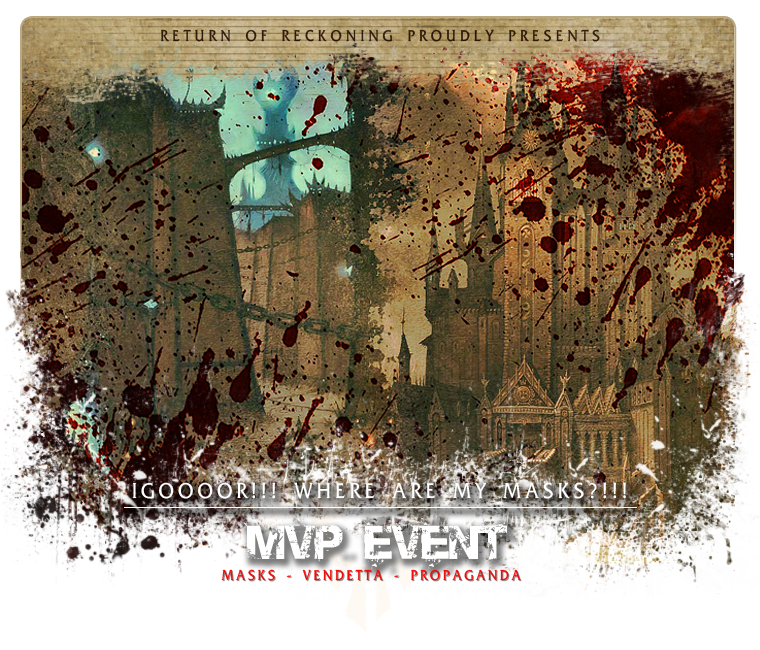 Participate in both Altdorf Warquarter and The Undercroft scenario while wearing a mask (can’t join those scenario without being masked) to receive your MVP token. Share the story of Dead Kings being assassinated in Black Crag Keep. Revive your faction by spreading these news. When you’ve collected 100 Vendetta secret list Item (in scenarios), talk to Masked Citizen in any City scenario. Learn the King’s Tale and share it. In any city scenario, Drop the Lord’s Tales and Share it. To share the tale, simply use the Granted Ability on a friendly player. > A faction needs their heroes and their martyrs. Participating in this suicide mission in enemy capital (Vendetta) will probably give you the possibility to be this Hero. Perhaps your sacrifice will be commemorated with a statue in your capital city. Every 100 point in City Scenario you get a MVP token. The best player of each class will have their statue erected in his capital when event ends. Classement will be updated daily on the forum thread. Altdorf: The Live Event Herald for Order is named Wild Eyed Guiltseeker and is located at (26776, 30868) by the Flight Master in Altdorf. Inevitable City: The Live Event Herald for Destruction is named Twisted Slaughterhag and is located at (29455, 32368) by the Flight Master in the Inevitable City. Goaf Birdsong - same as Halloween Event. Wearing a mask gives you a passive Renown and XP bonus . Don’t leave it ! This sounds super cool. You guys are really doing a great job with these events, and I think the server population is proving that. Keep up the great work guys! I'll be doing this tonight! See you in enemies capitals scenario ! Do masks use a special slot or replace your helm? > A faction needs heroes and martyrs. Participating in this suicide mission in enemy capital (Vendetta) will probably give you the possibility to be this Hero. Maybe your statue will be erected in your city. Every 100 point in capital Scenario you get a MVP token. The best player of each class will have his statue in his capital when event end. Classement will be updated daily on the forum thread. Ah, my epen is getting big already. Time to dust of your premades I guess. Aw, that breaks my set bonus. There is 8 mask so 8 unique abilities .